Salvador Domingo Felipe Jacinto Dalí i Domènech, Marqués de Dalí de Pubol (11 Mey 1904 – 23 Januar 1989), kent as Salvador Dalí (Catalan: [səɫβəˈðo ðəˈɫi]; Spaingie: [salβaˈðoɾ ðaˈli]), wis a prominent Spaingie surrealist penter born in Figueres, Catalonie, Spain. Dalí wis a skilled drauchtsman, best kent for the strikin an bizarre eemages in his surrealist wark. His penterly skills are eften attributit tae the influence o Renaissance maisters. His best-kent wark, The Persistence o Memory, wis completed in August 1931. Dalí's expansive airteestic repertoire includit film, sculptur, an photografie, in collaboration wi a range o airtists in a variety o media. 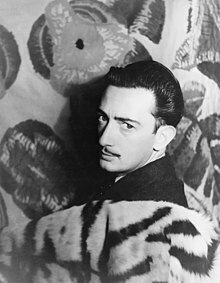 Dalí attributit his "luve o iverything that is gildit an excessive, ma passion for luxury an ma luve o oriental claes" tae an "Arab lineage", claimin that his auncestors war descendit frae the Moors. Dalí wis heichly eemaginative, an an aa enjoyed indulgin in unusual an grandiose behaviour. His eccentric manner an attention-grabbin public actions whiles drew mair attention nor his airtwark, tae the dismay o thae that held his wirk in heich esteem, an tae the irritation o his creetics. ↑ "Phelan, Joseph; The Salvador Dalí Show". Artcyclopedia.com. Retrieved August 22, 2010. ↑ Ian Gibson (1997). The Shameful Life of Salvador Dalí. W. W. Norton & Company. Gibson foond oot that "Dalí" (an its mony variants) is an extremely common surname in Arab kintras lik Morocco, Tunisie, Algerie or Egyp. On the ither haund, an aa accordin tae Gibson, Dalí's mither's faimily, the Domènech o Barcelona, haed Jewish ruits. ↑ Saladyga, Stephen Francis. "The Mindset of Salvador Dalí" Archived 6 September 2006 at the Wayback Machine.. lamplighter (Niagara Varsity). Vol. 1 No. 3, Summer 2006. Retrieved Julie 22, 2006. ↑ Meisler, Stanley (April 2005). "The Surreal World of Salvador Dalí". Smithsonian.com. Smithsonian Magazine. Retrieved 2014-07-12. This page wis last eeditit on 27 Februar 2018, at 07:35.